I’m known for being fussy about tickets. Perhaps they aren’t at the South Tynedale Railway which runs out of Alston. On our recent visit, we were seniors and this was the ticket we were issued with. Hmm! 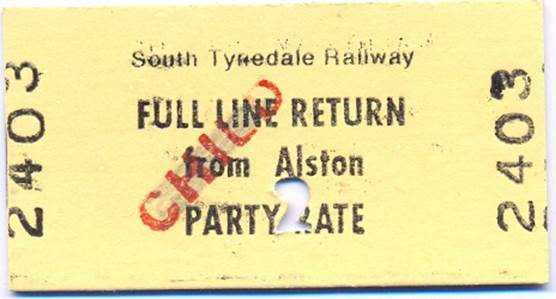 A child ticket at party rates! That doesn’t quite fit my wife and me. Well, it is only valid on the day of issue, but it hasn’t been date stamped and it is not transferable. Not even to a child on party rate? But do you know, I forgive them totally. The South Tynedale is not in the premier league of preservation railways and no doubt money is quite tight. 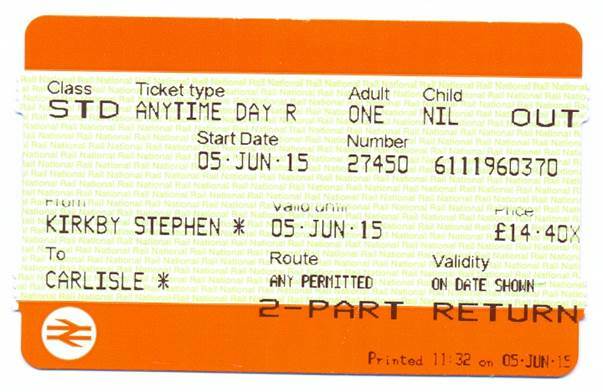 Why not economise on tickets. And I give them three cheers for at least using Edmonson style tickets. Mind you, they ought to since Alston is but 13 miles from Brampton where Thomas Edmonson devised his ticketing system which was designed to make accounting much easier. His system became near country wide by 1842. Pre-printed tickets seemed obvious for years – and serial numbers (the one shown is 2403) made for easy counting of tickets sold. Before Edmonson ticket sellers hand wrote each ticket. We are now in the post Edmonson era. Technology prints and calculates. And it must make life much easier for ticket issuers. So well done the South Tynedale Railway for sticking to the locally invented system, albeit with rather random actual tickets. No, not the one on the North Cornwall coast. This is the Welsh one on Cardigan Bay. It’s just an ordinary enough seaside town but it has one thing which makes it extraordinary. 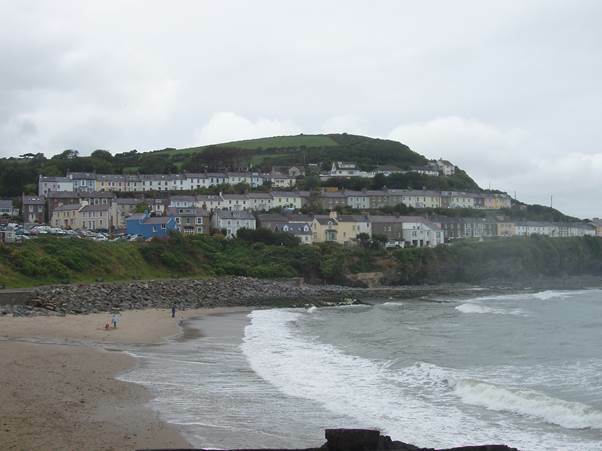 It is said that the basic idea for Dylan Thomas’s radio play, Under Milk Wood, came to him whilst staying in this little seaside town. What that Welsh bard actually thought of the place I don’t know, but maybe there’s a clue in the name he chose for the ‘fictional’ location of Milk Wood. He called his location Llareggub which has a Welsh ring to it (almost). But saying it backwards may give an idea. Newquay certainly has the cottages tumbling down the hillside. It is so possible to imagine Dylan’s characters, Organ Morgan, Captain Cat, Dai Breads, Polly Garter and all the others in Newquay. I think Under Milk Wood is a wonderful work. Its beauty rubs off on Newquay – and the townsfolk have taken their chance and make much of it. On our recent trip to the north we came upon, quite by chance, the Weardale Lead Mining Museum. We were encouraged to have a go at breaking stone which might contain ore and then taking any we found. The lead ore is called Galena and it glints in the sunshine. 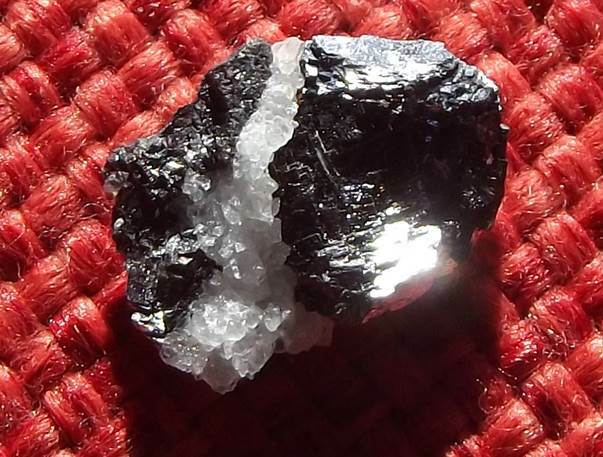 So there is my little bit of lead ore – galena. The whole stone is about a centimetre long. It has a lot of galena in it but its that very bright area at the bottom left which shows it best. The white stripe is (I think) calcite. Extracting the lead, which once had so many uses, was a lengthy process of breaking and pulverising and then smelting. Maybe we’ll take a look at some of this at that Weardale museum at some point in the future. Sheep need salt, just like humans do. I dare say the right amount is vital to our woolly friends, just as it is to us.. Many farmers buy salt licks and when a sheep feels in need of salt it goes and licks. Up in the North Pennines we found farmers could rely on the highway authority to provide this essential mineral for their sheep. This beast was on the roadside on quite a steep hill near Whaw. Whaw is actually in North Yorkshire. It certainly looked to be tucking in to the roadside salt and grit in the open container. And a farmer is saved the expense of buying salt licks. I wouldn’t dream of giving details of just where this is. We were trusted and shown this nest and whilst I’m sure the young birds have fledged and gone by now, there could be a second or subsequent brood. The Latin name that botanists give to the wren is troglodytes troglodytes. This literally translates as cave dweller cave dweller. We’d expect to find wrens in a cave but the cave is of their own making and is of a size to suit one of the tiniest birds in Britain. 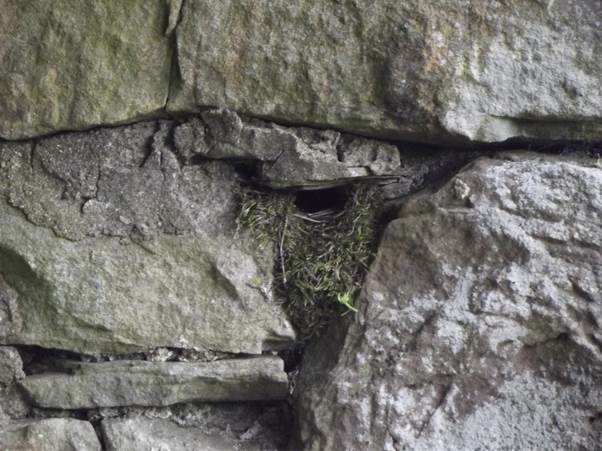 So here is the cave for one wren family. The wren has started by finding a ready made cave in a stone wall but it has made it wren comfortable and cosy with its own neatly made nest which just has a wren sized opening. It is a masterpiece of engineering. It was fascinating to see this, for despite being essentially a countryside person for all my life I had never actually seen a wren’s nest before. And now we can do no more than wish those wrens well. 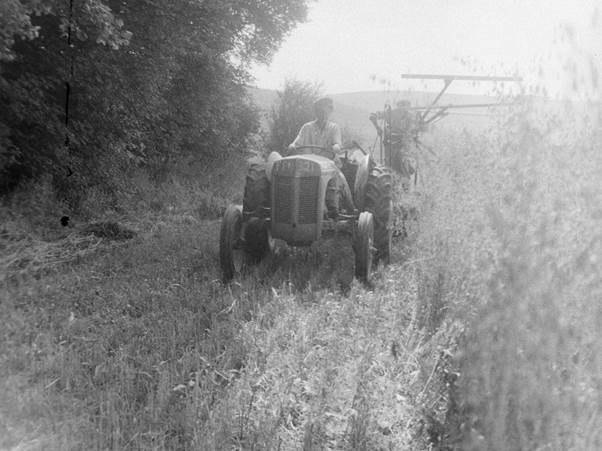 The Fergusson tractor was the work horse on British farms in the 1950s and early 60s. Many still survive and they are very definitely collected. I have two friends who own what affectionately get called little grey Fergies. One uses his for hauling a trailer into unlikely places. It has been in use on the village streets this week. The other is more of a collector and I believe he has three different versions which he is in the process of restoring. I don’t have one and whilst I love the old girls, I really wouldn’t want one. I just wouldn’t find the time to care for it – even if I had the expertise to do it. I just have a little model that was stuck on the front of a tractor magazine I gave my son a few years ago. 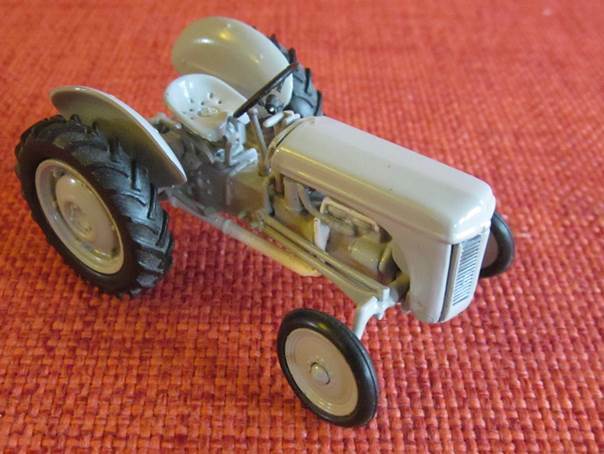 She may look tolerably the part but this little tractor is little more than 5cm long. It brings a smile to me, though, because this really was the ubiquitous farm power of my childhood years. Tullie House is a museum in Carlisle. 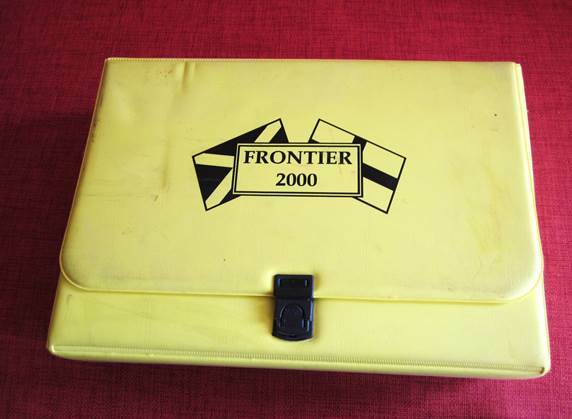 The museum first came to my attention back in the 1990s when I was asked to write a review of a piece of software called Frontier 2000. 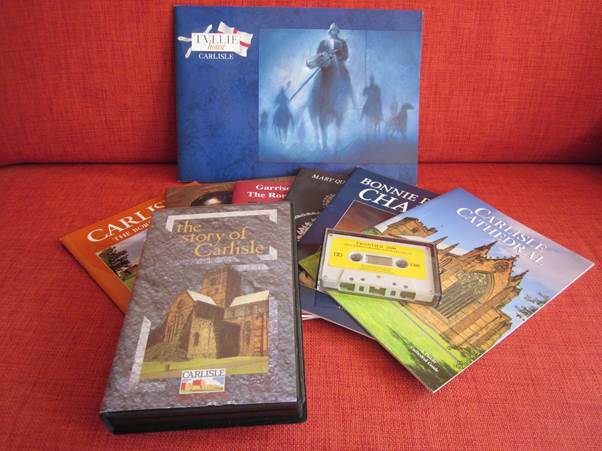 This was software for schools – and very good it was too with all the problem solving activities centred on Carlisle and the borders. Tullie House had clearly supported the development of this project and provided resources which meant it all came in quite a big pack. There’s the pack and here are some of the contents. There are blasts from the past there in the shape of an audio cassette and a VHS video. The software itself is on a couple of discs. There’ll be a whole generation of youngsters who have no idea what these are now. The so called floppy disc arrived and vanished in a short space of time. Tullie House provided a bit of Roman wood to enthuse youngsters. 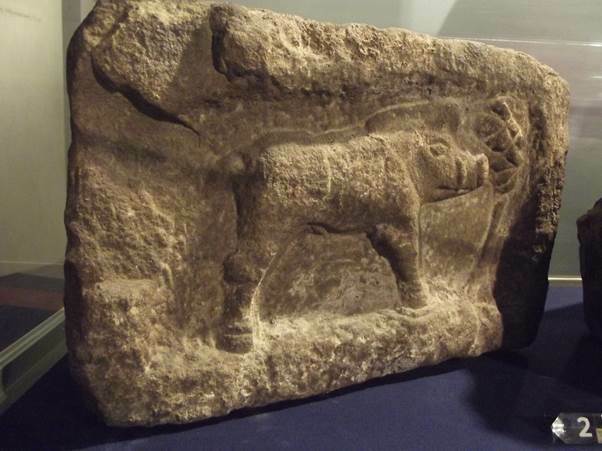 This came from an original Roman fort in Carlisle. Now let’s move forward to June 2015 and take a look at the museum which is in a rather ugly (my opinion) modern building. Once inside, though, the building doesn’t matter. There’s a large museum and all the staff we met were very friendly and helpful. There are lots of fun activities for children and, of course, lots and lots of artefacts. Photography is allowed although some items have a no photography sticker by them for copyright reasons. So here are some items which caught my eye. This, I understand, is a Roman mason mark. Fantastic and we have more Roman masonry below. But not all is Roman. Railways feature and here we have a rather austere mock-up of third class rail travel. My other railway artefact isn’t in the museum it is in the subway under a very busy road that makes it easy to get from castle to museum. The big sign has obvious meaning. The smaller one above is addressed to men. It means make sure you do up your flies after using the loo! Tullie House was well worth the visit. Amongst many things I have never done, flying in a powered aircraft is one of them. My flying experience has been limited to a glider – an enjoyable experience but for all sorts of reasons – none related to fear – I have not been known to go anywhere by jet plane, not to mention turboprop or piston engine flying machines. But back in 1909 Frenchman Louis Bleriot took a truly giant leap for mankind when he managed to get his plane from France, across the channel to England. 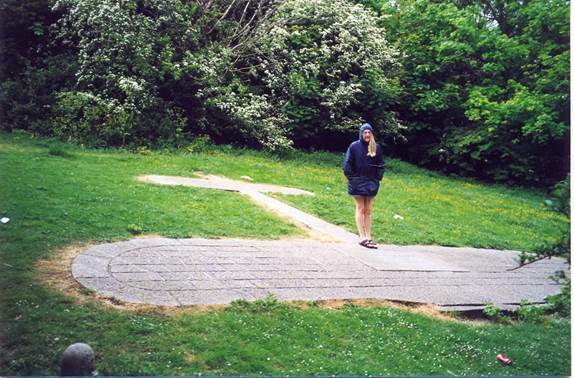 Back in 1998 I visited the spot where he landed which is marked with the shape and size of his plane. Here it is. That’s my then teenaged daughter standing (and shivering) on the plane. It is to be hoped that the surrounding bushes and trees had grown since Louis’ flight! 1998 was a mere 89 years after that maiden channel crossing by air. At that time there would still have been people alive for whom seeing the flight would have been personal experience. It was certainly well into the era of photography and this picture (from Wikipedia) shows Bleriot and his plane back on July 25th 1909. It was a close call for this site is more or less at the top of the famed white cliffs. Some of those bystanders will have lived into the jet liner age. What changes they saw. Last year, when we stayed in Wensleydale, we travelled on the Settle to Carlisle Railway between Ribblehead and Appleby. You can click here to see that. This June we stayed quite near Appleby and I was keen to go up to Carlisle by train. We caught it at Kirkby Stephen so duplicated a stretch to Appleby. Obviously this is not a much loved Edmonson style ticket but there are features to like. First of all it has all the information on it – date journey, class, price. It also has the famed double arrow emblem. Some of us remember the launch of this new logo (in 1965). Some of us are pleased it is still used to mean ‘railway’. 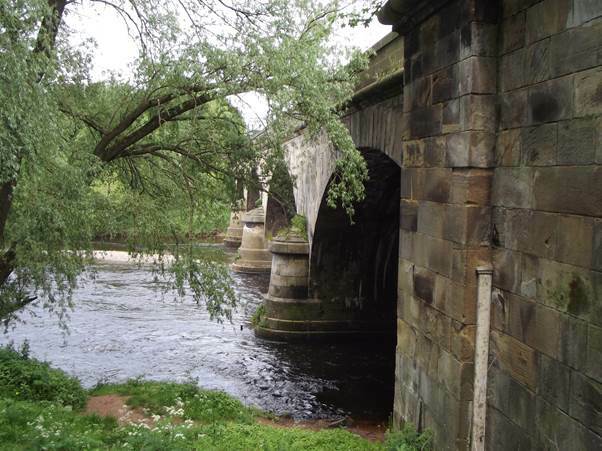 The journey to Carlisle follows the course of the River Eden. It is mostly attractive and pastoral and really rather prosperous looking land without the bleak grandeur of the more mountainous area to the south. Modern trains are not good for photography. I wouldn’t say our train was dirty, but the windows weren’t as clear as I’d have liked. Unless you can get your lens right on the glass, you are going to get reflections and certainly in this case the window also created distortions. These features are all there as we merged in with the track from Newcastle on the outskirts of Carlisle. The distortion makes the other track look seriously warped! I think of Carlisle as the red city. 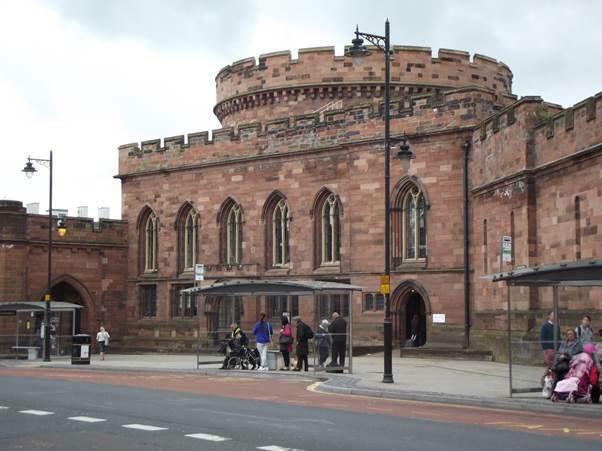 This is Carlisle Citadel, after which the station is named and here’s the cathedral as well. The castle is also made out of the local red stone. 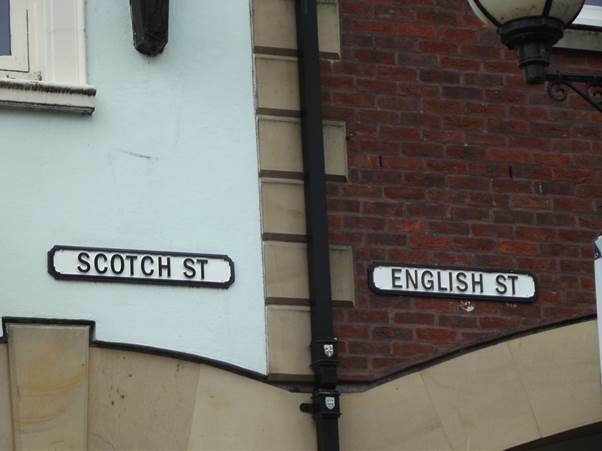 The border nature of the town, just a few miles from Scotland, is evident in street names. The River Eden has got quite large by Carlisle. It flows past an attractive park. Carlisle shops? They are much like anywhere else in town centres. There are the same coffee shops and national (or international) eating houses along with the usual run of chain stores. You might sense that this doesn’t much suit me. I prefer smaller places with individual shops.